You can send this page to up to five email addresses. Please separate each email address with a comma. Check out this awesome property I found on @MySpaceBA! You're getting the Best Price Guarantee! Lovely, sunny and bright one bedroom apartment with balcony and a great view. Located at the front of a building with 24Hs Security,. The apartment is on the 11th floor which ensures peace and quiet. 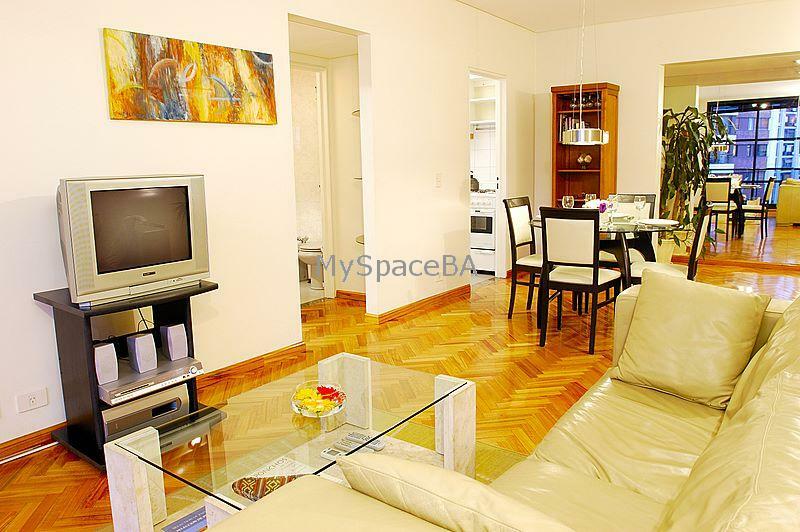 It is situated in the most residential and elegant part of Palermo, just 100 metres from the famous Libertador Av. The living room has a nice sofa, an elegant dinning table, TV, DVD, AC heater, and access to the balcony. The bedroom has a queen size bed and a nice view. The kitchen is fully equipped. The bathroom is completely with bathtub and shower. Very good building . Doorman 24hs . Elevators. Included: Electricity, water, gas, cable TV, High Speed Internet, city taxes. Cleaning service once per week. Observations: Payment is accepted in cash. Terms: Check in: 2PM - Check out: 11AM. 6) 25 Dec &1 Jan all day. See Complete Terms.